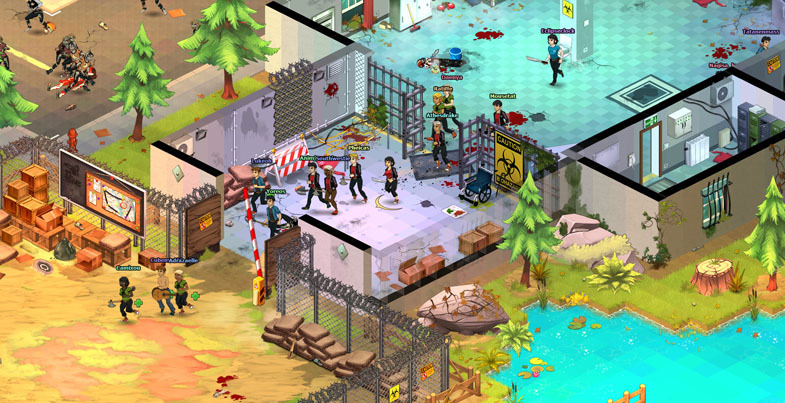 Dead Maze is a free-to-play zombie survival MMO published and developed by Atelier 801. 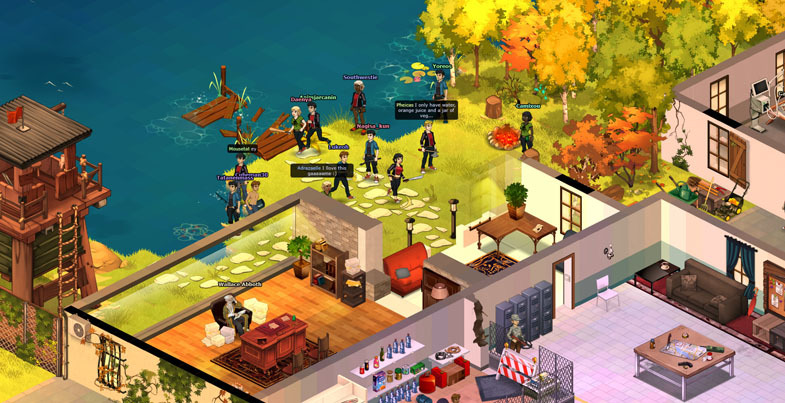 It recently left closed beta to release on Steam as a full-fledged game, admirably skipping the Early Access stage. But Dead Maze still must survive a fight through the night before proving itself as a competent multiplayer zombie apocalypse that differentiates itself from the bleeding corpses of predecessors on the market. The first thing that should be noted about Dead Maze is its style. Immediately, on the first screen of gameplay, it feels like a throwback to the summer of 2002. Humid summer nights playing Adventurequest on Mom’s old computer in the attic. It’s an odd, unwelcome nostalgic feel. Characters and enemies look like they were animated and drawn by an amateur artist plucked right off of Deviant Art, which becomes apparent as you cycle through the initial cosmetic items offered during character creation. Pants, shoes, jackets, and hairstyles all look like they were reused from a defunct Flash game, but surprisingly, backgrounds and cutscenes are drawn competently. While Dead Maze is a world with a garish color scheme, it doesn’t look half bad. Abandoned neighborhoods and overrun shopping malls have a unique hand-drawn style, but pop in and out of existence due to in-game lag. Buildings, zombies, and occasionally sections of ground cause the frame rate to drop severely when they pop into view. This can be deadly when you’re in combat surrounded by zombies and the game decides to rain, causing the entire environment to reload. When the game freezes, the player is a sitting duck. Combat feels akin to a MOBA. Skills can be activated using the number keys and range from attacks that deal damage based on enemy health, to more tactical choices, such as increasing aggro in an AoE or plumping up defense; this opens up a few different builds to try out. Weapons offer different effects for attack as well. Items like flashlights set nearby enemies on fire, while umbrellas increase defense for a short period. Dead Maze tries to take a page from Dead Rising by allowing an extensive inventory of zombie slaying tools that can be pulled from almost any prop. In a standard hour of playtime, you will have the opportunity to deploy bizarre weapons like toy cars, computer monitors, chair legs, and dolls. High-end items like maces and katanas sometimes show up as well, with less frequency. Thankfully, many items can be broken down using the crafting system, which yields a recipe for said item, in addition to resources. Resources can also be gathered from raw materials throughout the world. Things like industrial metal or logs can be found in places like construction sites, or more rarely from a standard cabinet or bag, then can be broken down and used to craft workstations that are housed in a cute home base that’s provided early on. Every player has a small plot of land in a fenced-in community, with a log cabin tucked into the corner of a large lawn. While it’s disappointing that you don’t get to build your own house from scratch, you can place created workstations and storage items wherever you want. The only constructions available from the get-go are water storage and a tool bench to develop weapons. Blueprints for additional workstations can be unlocked as rewards for leveling up or buying them in-game. While Dead Maze does have an in-game currency, one of its most admirable traits is that all items can also be purchased with Reputation (which is unlocked with every level), as rewards for specific tasks, or with Survivor Marks, which are rarer, but primarily used to buy emotes and certain clothing. While clothing gets the player out of the torn, ratty items they start with, it’s not essential. Bonuses like extra health or damage can make the game easier, but are ultimately trivial. The only clothing items that make a difference are Survivor Items. Survivor Items are things like medical masks that reduce toxic damage, fingerless gloves that increase defense, and a medical bag that allows the player to use an AoE healing skill. These items are rare drops that are equipped on pick-up and can’t be unequipped unless another article replaces them. While inventory can be recovered on death, Survivor Items are permanently lost, which is infuriating, but makes death properly intimidating. Dead Maze is worthwhile. The fact that it’s free makes up for the fact that it looks free. It’s hard to appreciate this game for its art, and while it does suffer from some pretty bad frame rate drops, it’s easy to forgive Dead Maze because it provides a fun, genuinely free-to-play experience that doesn’t require you to pay for in-game currency. This could change in the future, but as it stands now, it’s as playable as a free MMO can be. Grinding for items and cash can be a chore at times, but combat feels fun. It’s not an in-depth experience like Day Z, but for someone looking to kill some time with friends and not have to pay any cash, check out Dead Maze.